The nearest underground station to The Hellenic Centre is Baker Street (Bakerloo, Circle, Hammersmith and City, Jubilee and Metropolitan Lines). 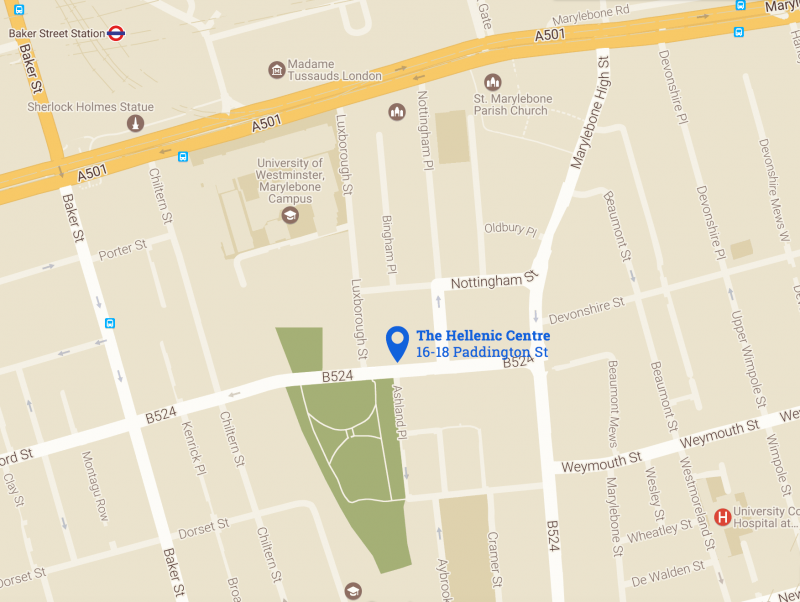 It’s a 5-minute walk from Baker Street station to the Hellenic Centre. The closest bus stops are for buses on routes: 2, 13, 30, 74, 82, 113, 139, 159 and 274. Visit tfl.gov.uk to plan your journey by public transport. The Hellenic Centre is just inside the London Congestion Charge zone. You currently have to pay an £11.50 daily charge if you drive within the Congestion Charge zone between 07:00 and 18:00, Monday to Friday. Check tfl.gov.uk for up-to-date information. NB Details may have changed since publication; please refer to Westminster City Council. There is metered and pay & display parking in close proximity to the Hellenic Centre. Meters are in operation 6 days a week (Sunday excluded) 8.30 am – 6.30 pm. Vehicles can park free-of-charge on single yellow lines or in pay parking bays after 18:30 Monday-Saturday or all-day Sunday. Parking is not allowed in Residents Parking Areas between 8.30 am – 8.30 pm, 7 days a week. For a map, pricing and further information click here Secure Parking 170 Marylebone Road Car park. Access to main venue is via steps; a stair climber is available. Please advise us in advance and we’ll ensure we’re ready for your arrival. A lift provides access to all floors, except the third floor. 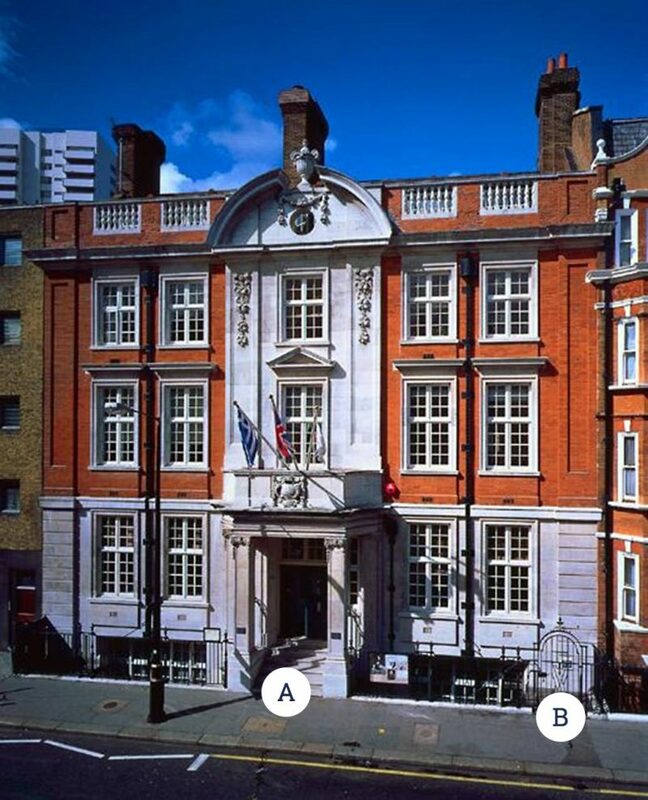 All deliveries to the Hellenic Centre must be made on Paddington Street, through the main entrance (A in image below). There are no off-street parking spaces or loading bays, and the Hellenic Centre has no back entrance. Interested in finding more about how we handle personal data? Find out how our policy complies with the Data protection Act 1998 and the GDPR.